The comprehensive guide to staying in lighthouses and lightships throughout the world. Throughout the world lighthouses are available to rent, ranging from hostels to self-catering apartments, guest houses to hotels. 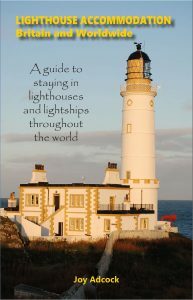 This guide gives booking and contact details for each of these, with a brief history and photographs of each lighthouse in Great Britain offering holiday accommodation. In addition, contact and booking details are given for over 180 lighthouses outside the UK.